In this process high slump concrete (highly flowing concrete) is poured in to the rubber moulds and compacted in Vibro forming vibrating tables. The moulds with green concrete are kept for initial strength gaining for 8-12 hours over flat plate. Then the cast concrete tiles are stripped out from the rubber moulds. These wet tiles are then kept in controlled atmosphere for 3 days for further strength gaining. Polyurethane or varnish coatings can be applied for added attractiveness & wear resistance. By handling carefully the rubber moulds can be reused more than 500 times after washing .Attractive long lasting colour faces can be formed by pouring white cement concrete with colour pigments first and then regular gray concrete next, economically with two layers. 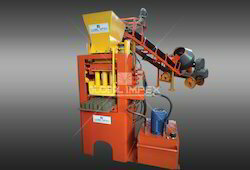 The high slump face concrete mix is to be mixed in separate exclusive tile mixer. The base gray concrete mix can be mixed with another tile mixer or regular drum type concrete mixer. Any architectural design (natural stone, wood grains etc.) can be duplicated in the tile face with the rubber moulds. The tiles of various thicknesses with rich colour & design add attractive, long lasting richness to interior, exterior floorings and wall face. 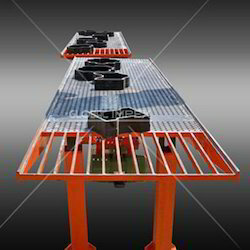 We are the eminent manufacturer and exporter of Vibro Table widely used by the construction industries. 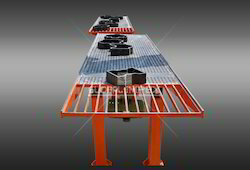 Operating on powerful motor, these vibro tables manufacture paving blocks, designer tiles, and kerb stones. Made available in customer specific dimensions, vibro tables provide high production capacity dependent on availability of moulds. 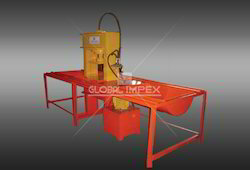 Our customers can avail these high performance machines at market leading prices. Looking for Paver Block for Flooring ?